Formed by wave and tidal action, a barrier island is an exceptionally flat type of dune system that lies parallel to the mainland coast. 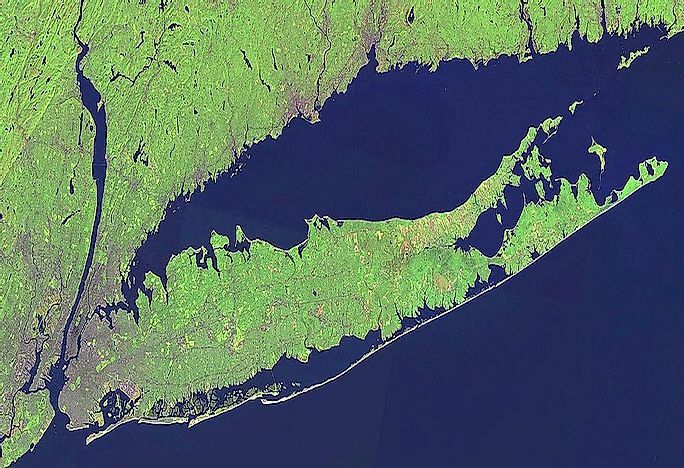 NASA Landsat satellite global mosaic image of Long Island, a barrier island. A barrier island is a ridge made of sand, found parallel to the main coast with a lagoon or a bay separating the two. A barrier island is a critically important feature on the coast as it acts as the coast’s first line of defence against storms and hurricanes and minimizes the impact and potentially lethal effects of the storms. While barrier islands are found all over the world, they are more prominent on the North American east coast and specifically around the Gulf of Mexico. Barrier islands vary in size with some islands extending over 100 miles. Scientists have yet to come up with a solid explanation of how the barrier islands were formed, but it is accepted that the barrier islands are formed in micro-tidal coasts where tides do not exceed two meters. There are several theories which have been fronted. One theory links the formation of barrier islands to the end of the most recent Ice Age. The theory argues that 18,000 years ago, increased global temperatures caused glaciers to melt which also caused them to recede towards the poles. The sea levels also began to rise, bringing with them sediments which were deposited on the exposed ridges along the beaches. After hundreds of years, the sediments built up and formed barrier islands. A barrier island is comprised of a beach, sand dunes, over-wash, and salt marshes. The beach is the part of the island which borders the open ocean and consists of the sand which is deposited by the ocean waves. The dune is the part of the island formed by sand deposited and shaped by winds. Stability of the sand dune is caused by the growth of natural vegetation or grows artificially through the construction of fences. The over-wash area of the island is also known as the barrier flat and is formed when sediments are pushed further inwards by hurricanes. The type of plant and animal species located on the barrier islands is dependent on their location on the island. The beach habitat of the barrier island is a harsh environment to sustain life due to its lack of fresh water and frequent submerging during high tides. The animals found include crabs and burrowing worms which feed on bacteria in the sand. The dune part of the island is also a hostile habitat due to its high salt content with the primary plants being bitter panicum and sea oats whose root systems help in stabilizing the dunes. The overwash habitat is home to cord grass and sawgrass. Barrier islands are critical in slowing down dangerous storms from the oceans and minimizing their impacts. The islands are also popular tourist destinations due to the sandy beaches, and many hotels and resorts have been constructed on the barrier island. However, the natural process of erosion and the rapidly increasing sea levels are threatening the existence of the barrier islands. Several measures have been put in place to remedy this problem with one being beach nourishment whereby sand is dredged and deposited on the beaches. It is an expensive and temporary solution to the problem.